Sometimes you might need to change admin folder name to make login to Administration panel more smooth and easy, and to reduce the chances of being hacked. From this tutorial you’ll learn how to change admin folder name. First, you’ll need to install a plugin which adds to the common WordPress options the one, that enables you to change your wp-admin slug. A slug is the short name of the page, that identifies it. Navigate to Plugins tab in the left column of Administration panel. Click on Add New button and type in the search field the name of the plugin. We’ll use HC Custom WP-Admin URL plugin as an example. Click on Install button to install it. Activate it to enable its options. 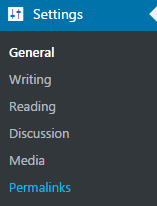 Now you need to go to the Settings tab in the Administration panel. Click on Permalinks sub menu. Find WP-Admin slug section and type in your preferable name you want to give to the page. Congratulations! Now you’ve changed your admin folder name! To use it log out of Administration panel and type in the name you’ve chosen instead of wp-admin. Log in panel will open.